Our Cañari guide leaned forward and spoke earnestly. “Did you know,” he asked, “that what we know as Carnaval today was originally an indigenous festival to give thanks to Pachamama [Mother Earth]? The Spanish imported their traditions to make us forget our own.” Here at Kushiwaira, at least, Cañari culture is still very much alive. 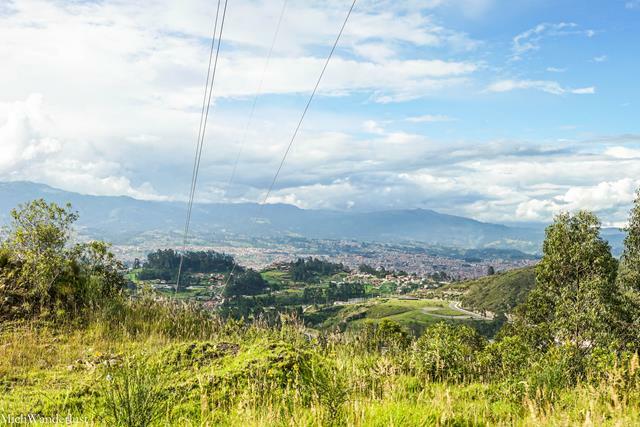 That was exactly what had brought us here from the nearby city of Cuenca, Ecuador. 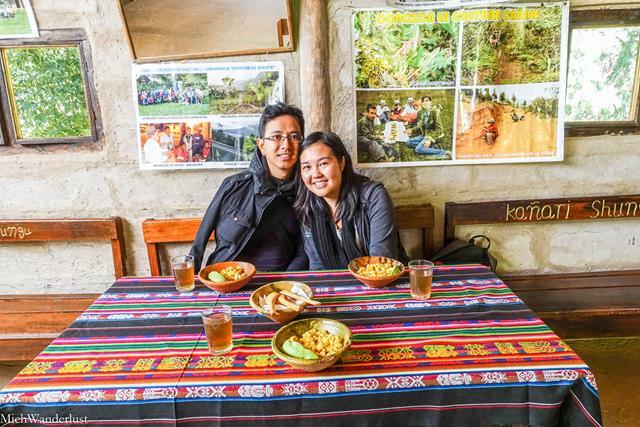 Lonely Planet calls Kushiwaira “one of the Cuenca region’s best-run community tourism projects”. Located in the Tarqui community, the project involves 12 families and has been running for 16 years. 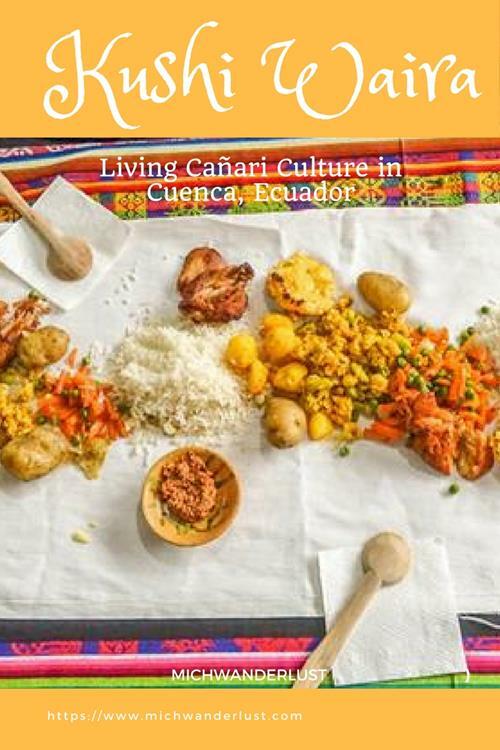 For an authentic experience of Cañari culture, you need look no further. Wait… who are these Cañari anyway?? We’ve all heard of the Inca empire. But they really only started expanding northwards from Peru into Ecuador in the late 15th century. Prior to that, Ecuador was populated by several tribes. One of the major tribes was the Cañari, who inhabited the Cuenca region. Despite putting up fierce resistance to the invading Incas, they ended up part of the Inca empire (albeit with some autonomy). Interestingly, when the Spanish came along, they sided with the Spanish – hoping to be free from the Incas. 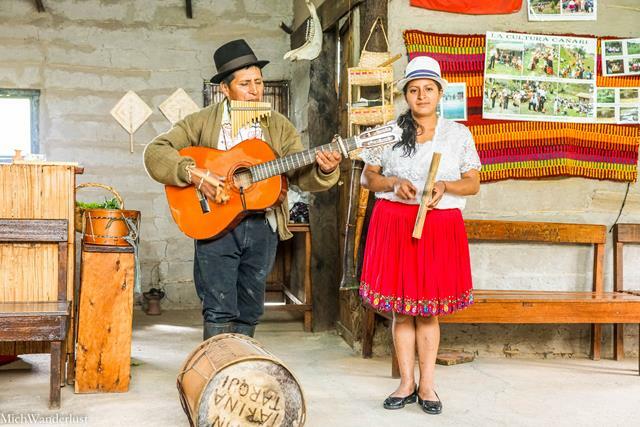 Today, there are still Cañari people – although they no longer speak Cañari, but Kichwa (and Spanish). Bear with me for a second because it’s a common misconception that Kichwa (Ecuador) = Quechua (Peru, Bolivia). To-may-to, to-mah-to, right? 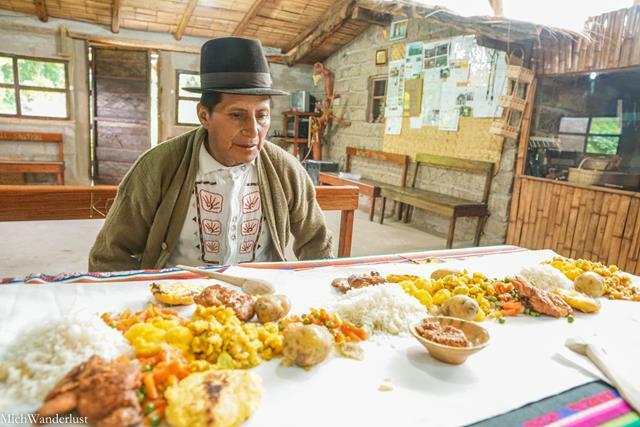 The Kichwa speakers I met in Ecuador swore that they could not understand Quechua speakers from Peru, and insisted that it was a completely different language. This article backs that up – to a certain extent. 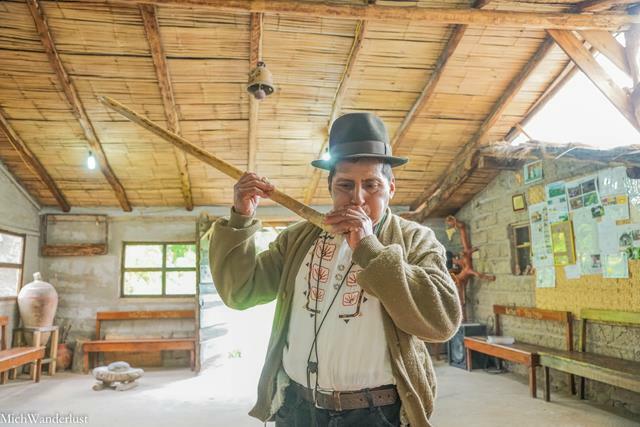 According to this researcher, Kichwa and Quechua are related groups of dialects. But due to their separate development over the centuries, the two have evolved to the point where they are mutually unintelligible. So Kichwa speakers can’t understand Quechua speakers, and vice versa. If you’re interested in languages, you might see a similarity with the way the Romance languages evolved in Europe. I encourage you to read the article in full if you’re interested – it’s pretty illuminating! Kushiwaira is part of the Jambi Runa Community Health Foundation, a non-profit organisation. 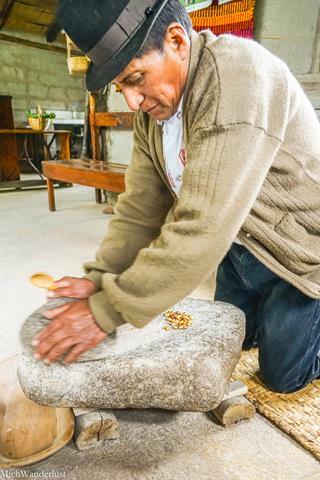 Its micro-tourism programme provides employment opportunities for indigenous locals. In addition, part of the income received is invested in healthcare for women, children and the elderly. You guys know I just LOVE visiting community tourism projects like Kushiwaira, right? Not only do you get to learn a lot about other peoples and cultures. You can also rest easy knowing that local communities are benefiting directly from you. In today’s world, the gap between the haves and the have-nots is growing wider than ever. We, as travellers, can and should do our part to avoid perpetuating this. And supporting projects like Kushiwaira is an easy and fun way to do so! 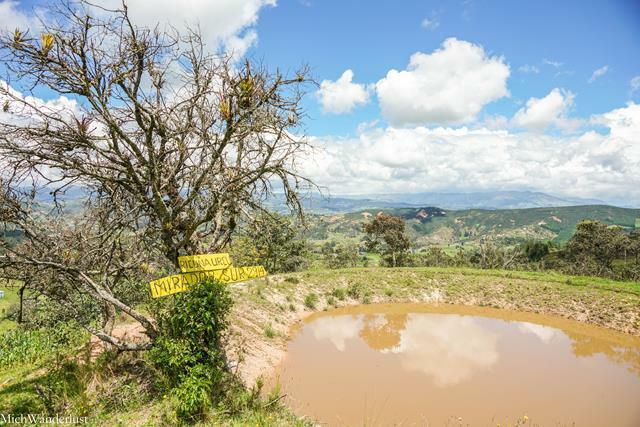 Kushiwaira offers both day tours (US$40 per person) and overnight experiences (additional US$15 per person). I wanted to do the overnight experience, but they had no capacity that day. So we settled for the day tour. Tip: Book in advance to secure your slot and don’t leave it ’til the last minute! I should highlight that at least one person in your group should be able to speak Spanish. When we went in March 2017, they didn’t have a translator on hand, so I just translated for Ian as we went along. You might be able to get by with one of those automatic translation voice apps though. I’ve seen it in action in Italy, and it seems to work quite well! We got picked up in Cuenca, and driven about 45 minutes to the community. There, we were greeted by our guide – Don Alfonso Saquipay, who spearheads the Kushiwaira project. After a brief introduction, we enjoyed a welcome drink of canelazo (a typical Ecuadorean drink made with cinnamon and sugar). It was followed by some mote pillo (mote, a type of boiled corn, with egg). After that, we hiked up into a primary forest which the Cañari regard as sacred. They have a truly unique worldview, a combination of indigenous beliefs (Mother Earth, Father Sun, nature spirits, etc.) and Roman Catholicism. 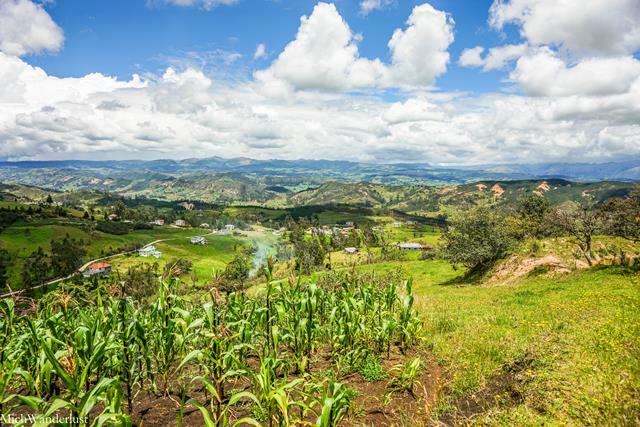 The land around their community is cultivated (you can see the corn plants above), but the primary forest is left untouched. From the viewpoint (above) at 2,914m (9,500ft) above sea level, you can see for miles – all of this used to be Cañari territory. The forest was almost preternaturally quiet. No leaves rustling in the wind or birds singing. Just the sound of our footsteps crunching on the forest bed. A sense of calm reigned in the air. The stillness was only occasionally broken by Don Alfonso pointing out various medicinal plants along the way. 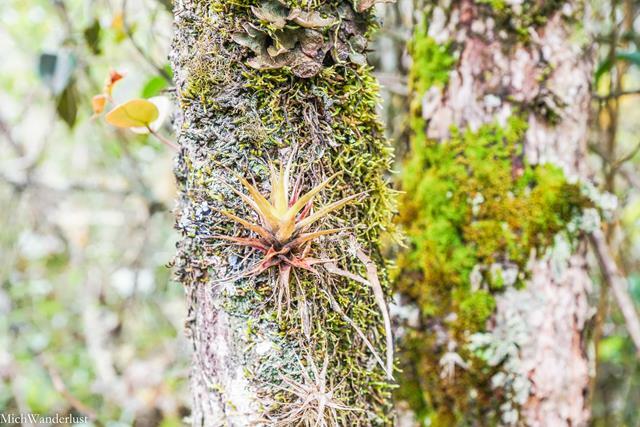 The Cañari have all kinds of medicinal uses for these plants. They use them to treat intestinal inflammations, nerves, and many more ailments. 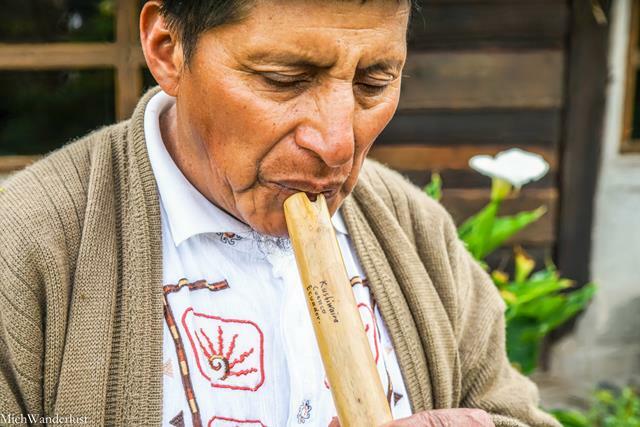 I was seriously impressed with Don Alfonso’s extensive knowledge of the plants we saw, and even more impressed by his passion for folk medicine. He spoke at some length about why natural folk medicine is better than conventional Western medicine. And, more generally, why organic food is better than conventionally-grown food. I have some sympathy for his views. In fact, I will stoutly vouch for the efficacy of certain TCM (traditional Chinese medicine) remedies. They work great for things like stomachache, sore throat, and hives (much better than anti-histamines!). That said, of course you should go to the (conventional) doctor if you have a more serious illness or injury. I view TCM as supplementing Western medicine, not replacing it. After about 30 minutes (a very short hike!) 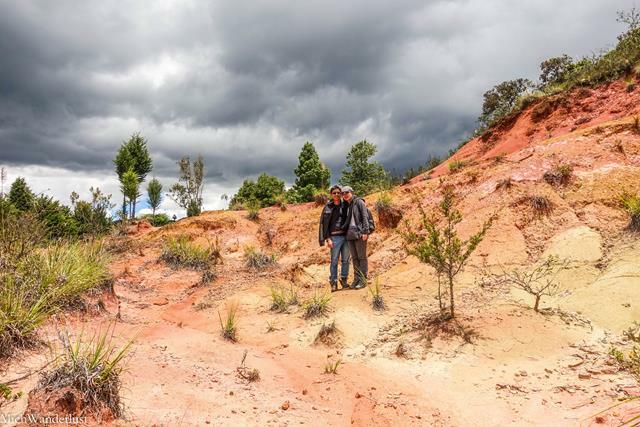 we reached a small clearing which the Cañari believe is – you guessed it – sacred (especially so, I guess). Don Alfonso instructed us to remove our shoes to better absorb the healing power of nature. Then he led us in some exercises meant to achieve a greater connection with nature and expel negative energy. After that, we walked down to meet the Inca trail. On this very road, the Incas used to transport people and goods. We were supposed to have the pampa mesa (traditional community meal) there on the ground. It’s usually done that way to strengthen your connection to the earth. But… it started raining, so we beat a hasty retreat back to the cottage and had the pampa mesa there instead, in a (more) conventional manner. 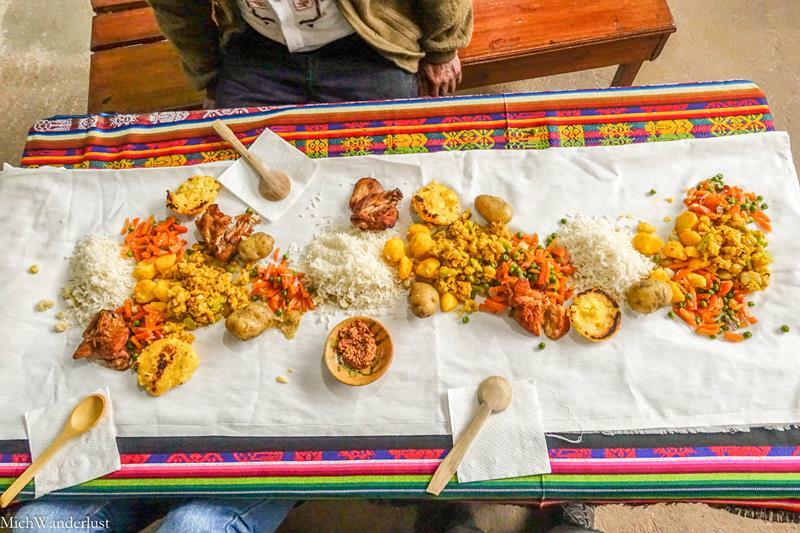 The pampa mesa is commonly eaten during Inti Raymi (the festival of the sun), to express thanks to Pachamama (Mother Earth) for their food. It was a bit strange eating off the table like that, but it was delicious. I don’t even know how to translate this. 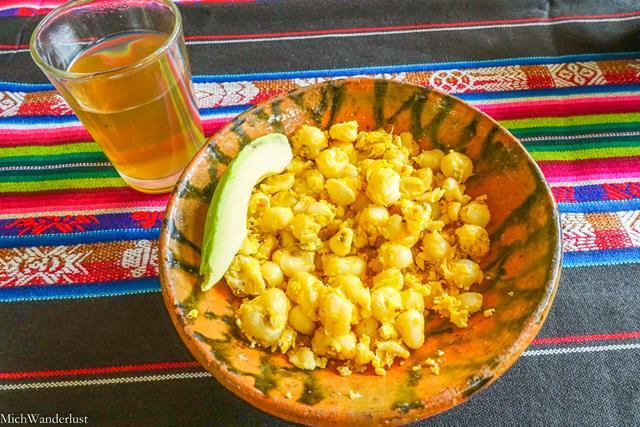 You grind toasted corn kernels (above), and the flour-like powder you get is called máchica. Ian and I had a go at it after Don Alfonso demonstrated – and boy, was it a workout! But then it got really fun because we got to eat it! With chilli paste and sugar, no less. YUMS. The girl above is Don Alfonso’s daughter. 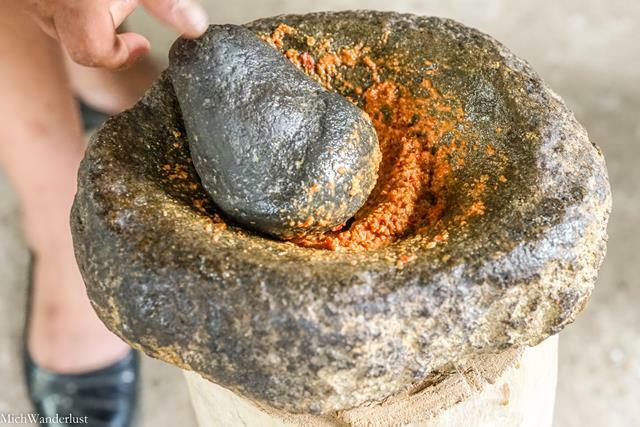 She pounded fresh chilli with salt and toasted sambo seeds (shark fin melon, apparently), until it became a thick paste. 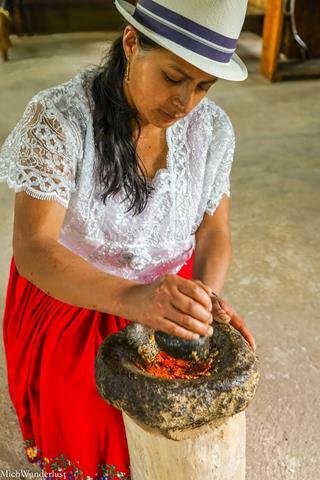 So we enjoyed our hard-earned máchica with chilli, sugar and mote. Y U M M Y. Among Don Alfonso’s many talents, he hand-makes and plays a startling number of traditional musical instruments. 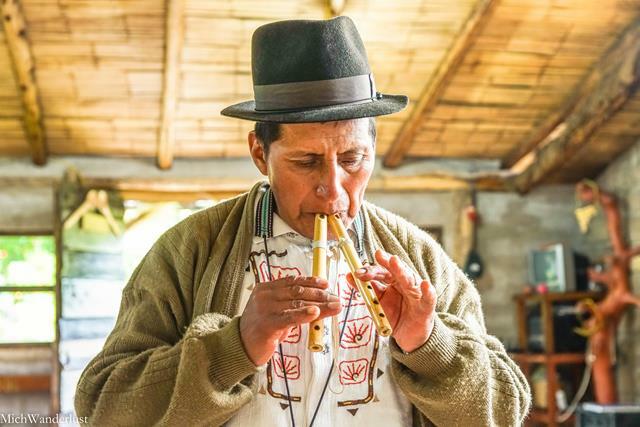 Like the Andean flute, quena, and pingullo. Up to that point I’d been suitably impressed. But I had trouble getting my jaw back up from the floor when his daughter started dancing to the music, while spinning wool. I don’t know if spinning wool is comparable to knitting. But I knit, and I know that my head would explode if I tried to do that while knitting! At the end of the tour, Don Alfonso had a little surprise for us. He would give us one of his hand-made musical instruments each, but we had to earn them. 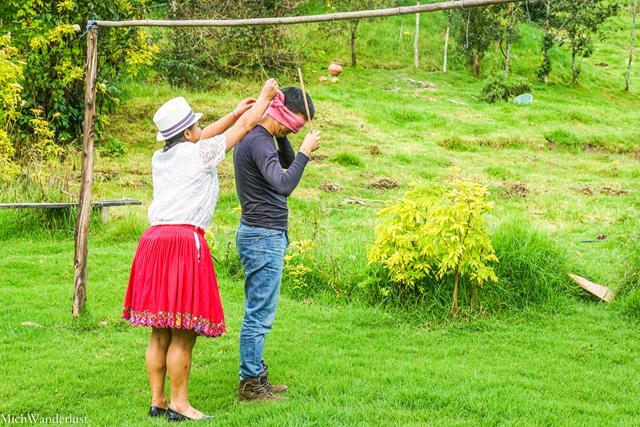 First, we would play a traditional game which involves being blindfolded and trying to find your prize. They made it super easy for us, though, thankfully! Then came the second part. We had to dance well enough to earn our prize! It wasn’t as difficult (or embarrassing) as it sounds. 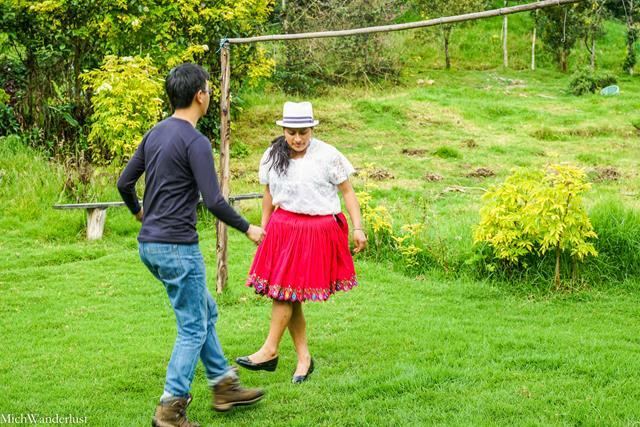 Don Alfonso’s daughter danced with us, so it was simply a matter of following her lead. Thus we emerged victoriously with a flute and a quena. Of all the souvenirs I got from Ecuador, these were by far the most unique. As we were leaving, Don Alfonso handed us some Kushiwaira brochures and asked if we would help tell our friends about them. Sadly, after months of travelling, they became so tattered that it would’ve been positively rude to hand them out. 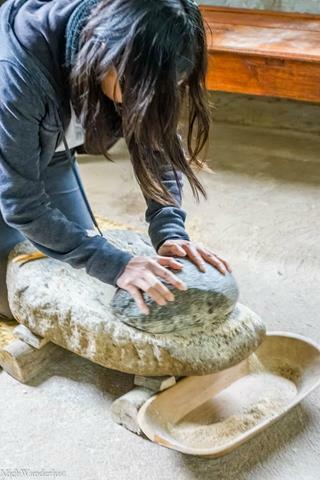 Prices: day tour – $40/person; overnight stay – additional $15/person. What’s the most unique cultural experience you’ve had while travelling? Next Next post: Museo Pumapungo: The Best Museum in Cuenca, Ecuador? Interesting post! I have never heard of this culture, but then again only spent 1 day on mainland Ecuador en route to the Galapagos. I have been thinking about a return and will keep Cuenca in mind as a possibility! 1 day in mainland Ecuador is too short, especially if you spent it in Guayaquil 😛 No hate for Guayaquil, but Quito and Cuenca (for me) have a lot more to offer! In my completely biased opinion, you should definitely make a return trip, haha. Thanks for stopping by, Leigh! It’s so great that you truly take the time to get to know the people and the culture on your travels and find the real authenticity! This is so great! Thanks for linking up with #TheWeeklyPostcard! I had not heard of the Canari before. I went to Quito but it was for work, so I didn’t get to explore more. Now I am wishing I could have explored outside the city more. The tour you took sounds great. I am curious to see if I would feel anything in that clearing. I also wonder how many people don’t feel anything but tell the guide they do? Thanks for sharing on #TheWeeklyPostcard. 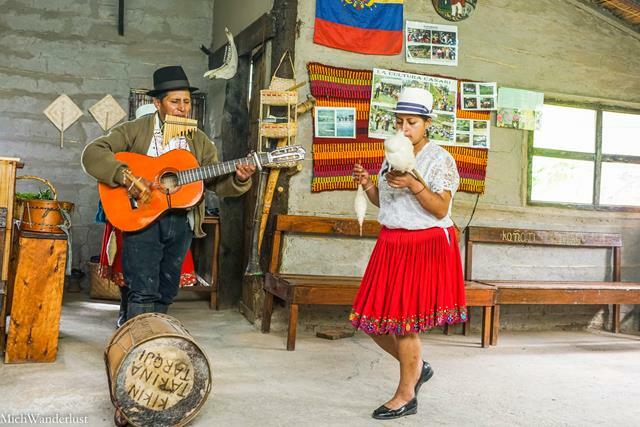 This day trip looks amazing and so many cultural experiences all in one day! I love that you learned so much about this history, food, and even had to earn your prize souvenir! Wonderful opportunity to join in a local festival and learn how their produce is prepared. I wish we could have joined in the festival, but it was the wrong time of year 🙁 So it was just for the two of us (eating with our guide) – still a pretty cool experience though! Thanks for stopping by, Sally! What a really amazing experience! Sounds like a great way to learn about the culture. I think it would be so interesting watching them prepare the food. It really was an unforgettable experience, Brianna. Food prep is always fun , isn’t it? 😉 Thanks for stopping by! The meal looks enormously interesting, and I like the fact that everyone eats together, but it looks awfully hard to make lol! Having said that, I think the most unique cultural experience I’ve had while travelling was when I went to Vietnam. I had a porcupine meal and whisky that had been “pickled” with a huge snake! Wow, you’re really adventurous, Victoria! You had porcupine?! I’ve had some pretty out-there food (they say we Chinese people eat everything, and that’s not inaccurate haha), but I’ve never heard of porcupine being eaten! Ditto for the snake-whisky(?!)! How was it? ?